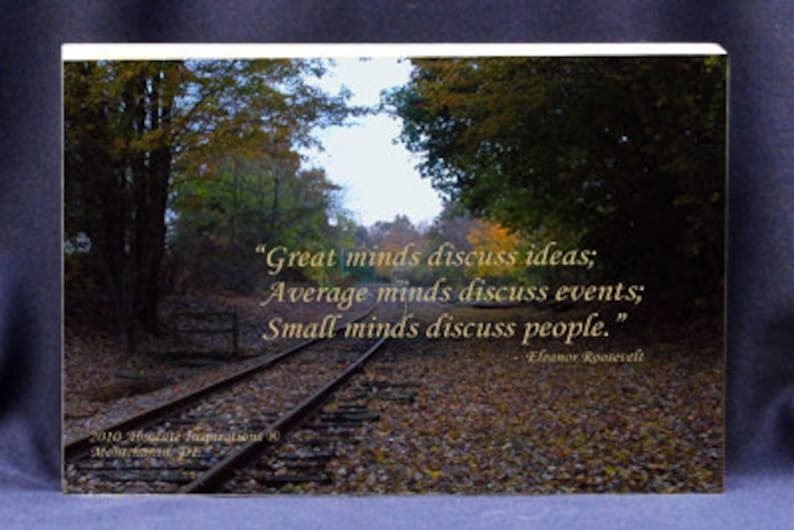 Unique gift plaque for home or office: "Great minds discuss ideas, average minds discuss events & small minds discuss people" Photo,quote & plaque all in one! The Inspirational Photo Block © designed by Vicki D. is better than a greeting card and the gift that keeps on giving! Regarding our turn around time: All customized gift orders will be received and processed Monday Thursday. All orders received from Friday – Sunday will be received and processed on Monday. These are designed for you and it usually takes 2 - 3 business days to completely create a gift and ship it out on your behalf. We will invoice you for the additional cost of shipping if you order more than one plaque.